Fragile. Sold as IS with no returns. Very Rare. Please read the entire post before ordering. 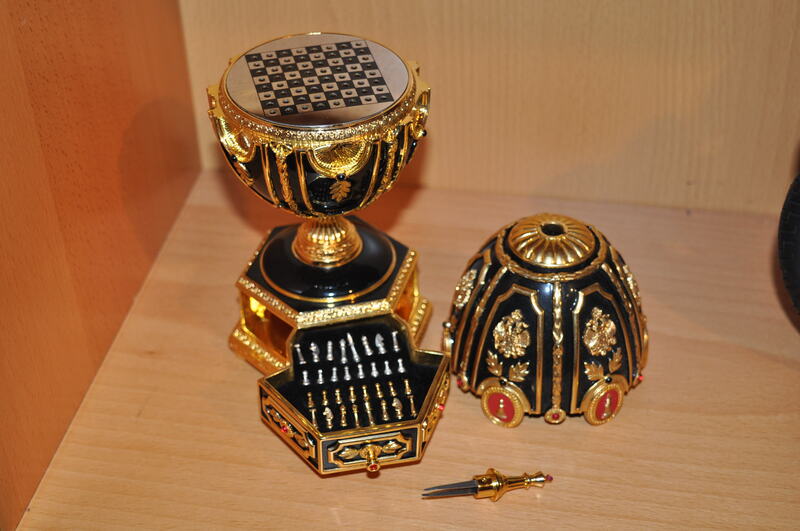 For your buying pleasure – Franklin Mint Faberge Chess Egg Set Place it on display and enjoy it now or put aside for future as an investment! Comes with 32 chess pieces. Top finial. The last image shows page from the catalog with description. The catalog is not included in this sale. Condition – was on display. some signs of aging. could use light cleaning and polishing. I don’t see any damage, missing pieces or stones. May have some tiny nicks that I missed. No packaging or papers. Included – The egg with 32 pieces. what you see pictured. Nothing else! Please check my other listings – Franklin Mint I combine shipping. Many prototypes, artist proofs from the FM archive. This is an extremely delicate model with a lot of small parts. It is commonly known that Franklin Mint collectables are very fragile. The buyers are usually acceptable to the notion that a small repair might have to be performed. I will pack securely in bubble wrap and carton box. However, further minimal damage could occur during the shipment or especially while unpacking. You may need to reattach or glue a small part. If you are looking for a perfect 100% item, please be aware that I can only guarantee that it will be as described when it is packed and shipped. I accept no returns. If the package arrives damage, insurance will cover this. If the package is not damaged, you agree to accept the item as is. I photograph all items before shipping. All International buyers are responsible for the fees and charges incurred by their country . I either have in stock (100s+) or will try find for you this rare chess piece or pieces to complete your valuable Franklin Mint Chess set. Do not make a purchase. First, please contact me with your specific needs. 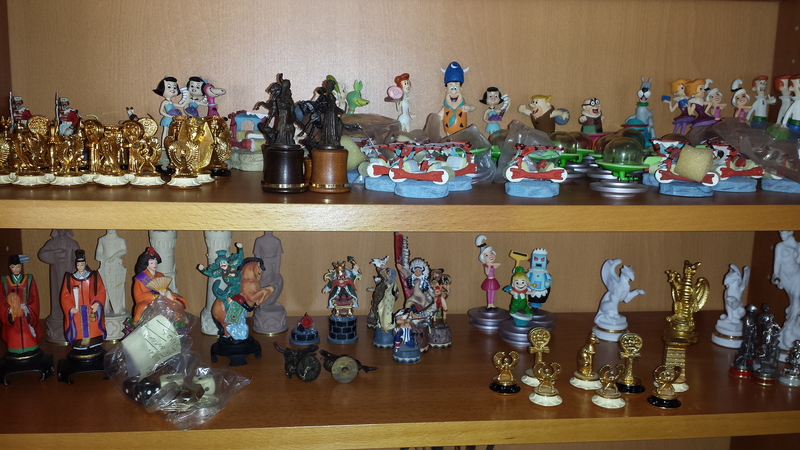 Pieces from the FM Royal Heraldic, Indian, FIDE, Star Trek 3D, Star Trek 3D Next Generation, Looney Tunes, King Tutankhamen (Tut) Faberge Egg, Remington, Orient, Roman and many other sets. Individual pieces are offered for sale. Many available. I have a number of new/like new spare pieces available at a cost of $20-$135 (some include original styrofoam boxes) and used pieces with some wear at a cost of $10-$105. Please contact me if you’d like to make special arrangements.